Several people have asked me about a recipe for 7 Up Biscuits. I looked at several recipes online and on Pinterest and this is my recipe for these biscuits. I made two batches of 7 Up Biscuits. The first batch I used Bisquick and the second batch I used self-rising flour. Most of the recipes I found online use a baking mix in the recipe instead of flour. Most recipes also called for 2 cups of the baking mix. I found this was not enough and the dough was really wet. Both recipes turned out good. I think the ones using self-rising flour were taller but the ones using a baking mix may have been a little fluffier. The bottoms get brown because of the butter and both recipes turned out very good. I really liked the ones with flour a little better than the baking mix and you use less flour. You can choose which one you want to make or bake both and do your own comparison. Let me hear from you in the comments if you try these. Cut the sour cream into the baking mix until mixture resembles course crumbs. Add the 7-up and mix with a spoon. Pour the melted butter onto your baking sheet. (You will need a baking sheet with sides or a casserole dish) Drop biscuits or roll and cut out onto the butter. Bake in preheated 425 degree oven for 12 to 15 minutes checking for doneness since ovens vary. Note: I cut mine out with a biscuit cutter and brushed tops with more melted butter about two minutes before they were done. If not brown enough on top, turn on broiler for last minute or so.) Makes 10 biscuits. Same instructions as above except you use the self-rising flour. Makes 10 biscuits. I love all biscuits and love experimenting and trying new biscuit recipes. I will definitely make these again but will probably make the self-rising ones. Just my personal choice. Enjoy! 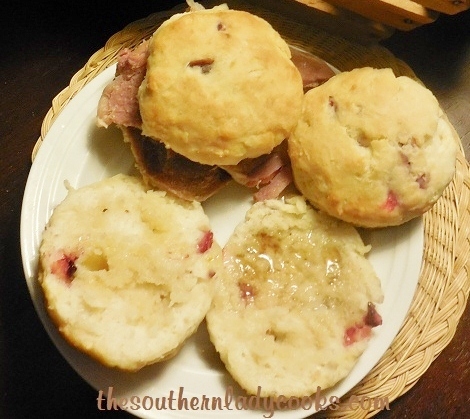 Don’t Forget to Pin these 7 Up Biscuits! Feel free to “share” with your friends by clicking on the Facebook, Twitter or Pinterest buttons below. You can print by clicking on the printer icon below. It is the green square with a printer inside. I wonder if you can drop these on a casserole instead of bought biscuit? Can you use sprite instead of 7-up? I haven’t tried it, but I don’t see why it wouldn’t work. You can use Sprite, Diet Sprite, Diet 7-Up. I have also used the lemon/lime version of Le Croix, which has no sweetener at all. It worked fine. Also, I have used plain Greek yoghurt, instead of sour cream. Probably non-Greek yoghurt would work, too. I’ve used club soda or ginger ale for the 7-up. Used Greek yourt for the sour cream. Yes, you could do that Gloria. Gloria, for each 1 cup of self-rising flour needed use 7/8 cup all-purpose flour plus1 1/2 teaspoon of baking powder and 1/2 teaspoon salt. How much is 7/8 cup of flour? Been making these for years and we love them ! I will never buy another biscuit ever ! My grandson who is 9 wanted to make these ..so I totally let him do everything…They turned out great . Made more than 10 biscuits. We ate more than 10…So good and easy to make. Thank you for the recipe. Love your site. Try baking them in a cast iron skillet. The only pan to cook biscuts or corn bread in. Carbonation: what a great idea! I prefer baking from scratch too, but being a cheapskate, didn’t go out and buy a mix to experiment in the interest of science. I found the 7-Up biscuits too sweet but absolutely loved the texture of these biscuits. I substituted club soda for the next batch and they were to die for — light and scrumptious without the cloying sweetness — also much friendlier for my diabetic friends and family members who often gather ’round our table. Thanks so much for the recipes and your lovely website. You’ve created such a nice community! awesome Idea on the club soda! Thank you! Your mix ones were probably fluffier due to a shortening and buttermilk powder, etc. , in the mixture whereas self rising flour only has flour, baking powder and salt, I believe. I, too, have tried many different ways of baking these through the years as this was Popeye’s Copycat recipe originally I believe and I have used many flour/mix sources and many soda/ginger ale sources and though they were most all good the Pioneer or self-rising flour and Sprite or Ginger Ale were my favorites. Each of these were very good as compared to the others were good. All were yummy but like you said different! Thanks for compiling all these recipes for us to enjoy! You do a Southern gal’s heart good!! I used Autry Buttermilk Biscuit Mix in is in a red bag. I made these but I substituted greek yogurt for the sour cream. They turned out wonderful. Couldn’t tell the difference. These are SO good. I was in a rush, so I just patted the dough out in a 9-inch round cake pan and baked them. Spread some more butter on top when done and cut into wedges to serve. Will definitely make again. I used this formula with success. 4 cups Bisquik in dry measure cup, 8 ounces each of sour cream and 7-up in liquid measure cup (they are different measuring cups), and mix in large bowl with large spatula. Scrape out dough (very wet) onto pastry cloth or board upon which you have put a thick layer of Bisquik, then put more atop dough. Dust hands with Bisquik, then knead briefly. Pat into square or rectangle, dust knife with Bisquik, then cut into fairly equal squares. Put stick of BUTTER into 13 x 9 pan in 425 oven until butter’s just melted. Remove pan and fit biscuits into pan. Squeeze them in! Bake at 425 for about 15 minutes or until they look brown enough on top. Bask in the delighted oohs and aahs around the dinner table. Especially good with your favorite jam, etc. The recipe could be halved, why would you want fewer biscuits when you could have leftovers for breakfast? Yes oh yes! I just tried these for the first time a few days ago…and we loved them. They were fluffy and I adore the crispy bottom they get when baked in butter. OH MY! I’m using 2-1/2 c. bisquick…and while they’re still pretty sticky, it seemed to work well. I will definitely try them using 3 c. next time. Thanks for sharing your ‘tests’ with us. I’ve tried these biscuits and you’re right, the dough is very wet. These things are awesome. I have found that they taste better when made with Pioneer Baking Mix. Everyone I’ve made these for loves them, and I gave the recipe to a friend, but when she made it, she called me because they didn’t taste the same. She asked me what might the difference be. She used Bisquick, and I used Pioneer Baking mix. She got some Pioneer mix, and told me the difference was amazing. To me and mine Pioneer is far superior to any other brand! They look & sound real good. I have to share this with my daughter. Went on pinterest to pin this recipe. OMG I couldn’t leave ! So much to see. I am now following you there also.